Lil is an old woman who spends her days shelving rare books in a tiny Manhattan bookstore and lonely nights at home in her apartment. But Lil has an intriguing secret. Tucked and bound behind her back are white feathery wings--the only key to who she once was: the fairy godmother responsible for getting Cinderella to the ball to unite with her Prince Charming. But on that fateful night, something went terribly and beautifully wrong. Lil allowed herself the unthinkable: to feel the emotions of human beings and fall in love with the prince herself, going to the ball in place of Cinderella in her exquisitely gorgeous human guise. For her unforgivable mistake, she was banished to live among humans, far from her fairy sisters and their magical underwater world. But then one day she meets Veronica--a young, fair-skinned, flame-haired East Village beauty with a love of all things vintage and a penchant for falling in love with the wrong men--and suddenly it becomes clear to Lil that she’s been given a chance at redemption. If she can find a soul mate for Veronica, she may be able to right her wrong and return to the fairy world she so deeply longs for. CAROLYN TURGEON is the author of severl works of fiction, including Rain Village, Mermaid, and The Fairest of Them All. Visit her website and blog at carolynturgeon.com. "Turgeon's work is haunting and hypnotic, blending the line of reality and magic into a gorgeous flowing narrative. Set against a modern day backdrop, this tale reexamines an all-too familiar story and breathes new life into it." 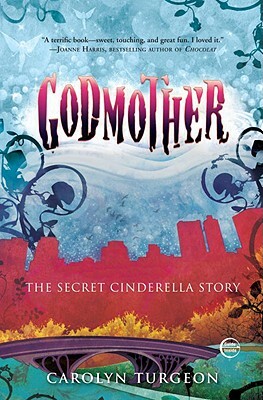 "Godmother is a true exploration of the dark vitality of city life and the hidden horrors of the fantastic."